by Mir on November 22, 2007 in What do I do all day? Yesterday I cooked and worked and cooked and worked and cooked some more and worked some more and told my daughter that if she behaved she could help me with the pies and that if she didn’t, I would chop her up and put her IN the pies. It was mixed bag of a day—rather more frenetic that I would’ve liked, plus it’s hard to behave when you’re off school and everyone is busy ignoring you in favor of preparing dinner for people you don’t even KNOW, MOM—but in the end, we more or less did both. I hope our guests like pie. I’ve never made a pie with a lattice top before, mostly because—like baking bread, before I started doing it—for some reason I believed it would be too difficult for my wee, delicate little mind. It really isn’t. Then, of course, we had to have pumpkin pie, and here I made good on my threat. I think Chickadee will still live a productive life with only one hand, and after all, it WAS in the name of extreme cuteness that she gave it up. I hope Chickadee is left-handed because re-learning to write would not be the most fun a person can have. Happy Turkey day, Mir, Otto, and Mirspawn! It certainly is a cute hand, and occupational therapy will get her through the rough patches. Have a Happy Thanksgiving, lovely Mir! Happy Thanksgiving! 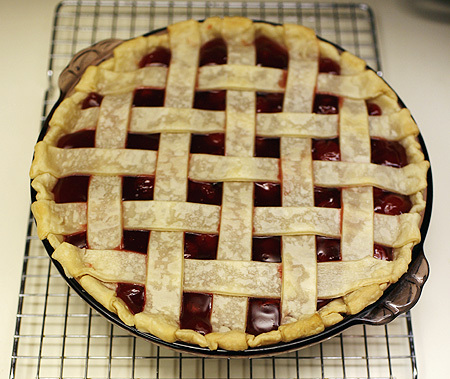 I always thought lattice top pies would be too hard too, so I’ve never tried making one. Maybe now I will! Now that is a cool looking pie! Cute pies! I love the turkey hand topper – what a great idea! Cute pies and the lattice top looks lovely!!! I’m sure Chickadee will adjust well. Happy Thanksgiving!! Yes, pies from scratch intimidate me too! That turkey hand topper is AWESOME and quite an inspiration though. :) Great job, Chickadee (and mom). Impressive. Did you make the crust from scratch? That’s the part I abhor. But otherwise I think pies are great fun. (It seemed like the perfect time to delurk, for some reason — maybe those awesome-looking pies are what did it)! Happy Thanksgiving! That turkey is so cute and your lattice work is beeeyootiful! Have a good one! That is adorable. Makes me wish it were more than just a boring old Thursday here! Wonderful lattice pie….and I love the pumpkin ‘turkry’ pie….so cute! Have a wonderful day. My poor bare little store bought pumpkin pie is weeping at it’s nakedness. Hope the people you “don’t even know” enjoy their Thanksgiving at your home!!!! three kinds of pie in our house! the lattice on yours is perfect. i just do crumb topping because…well, i adore crumb topping. man, is it time for pie yet?!?!?! i got a shoo fly pie singing its siren song in the kitchen…blasted pie! I wish I saw this last night before I made my pies!!!!!!!!!!!! We are DEFINITELY doing that next year, I love the kids hand as a turkey. love the pies. never thought to put a topper on a pumpkin pie but you did beautifully. Be sure to thank Miss Chickadee for lending a hand with the pie. Cool pies. I’m leaving the cooking to my sister, and bringing some rolls. How freakin’ cute is THAT???? 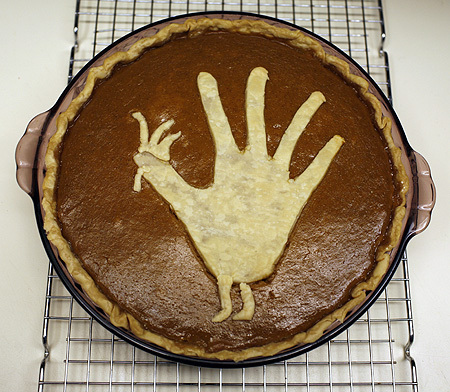 Now I’m bummed my pies are already done because I have to wait until next year to do embellish my pumpkin pie with a hand turkey. The pies are picture perfect. I hope your unkown guests loved them too! I’m sure by now they’re all gone. Good thing you took pictures to prove they existed. Enjoy having the kids home again tomorrow! Cute! I am so knocked-out tired by the time the pie comes I don’t think I’d even notice the adorable handprint. I hope you displayed it ahead of time for bragging rights. It’s the best type of Thanksgiving. Happy. Pie R not square! Pie R very cute! Okay, how cute is that hand? I *love* it! Look, at that. Your pies look fabulous!